Though no scientific studies have been done to prove that appropriate dental care will extend your dog’s lifespan, I am convinced that it will. Dental disease is perhaps the most common malady seen in dogs today, especially small breed dogs. This is not just about “dirty teeth”. Dogs with periodontal disease suffer from infection and inflammation that can lead to tooth loss, gum disease, and significant pain. Bad odor coming from a dog’s mouth is not normal. The smell comes from bacteria and is my first clue that a dog has an unhealthy mouth. Besides the effects on the gums and teeth, dental disease can cause problems in other body systems. In people, there is a conclusive link between heart disease and periodontal disease. Longstanding inflammation and infection in the mouth set up for bacteria being released into the bloodstream. The kidneys, liver, lungs, and heart can all be damaged by this bacterial shower. Many of my clients are surprised when I point out problems in their dog’s mouth on a routine physical exam. A thorough oral exam is one of the most important parts of my examination. Most dogs will develop some degree of periodontal disease during their lifetime depending on breed, age, genetics, and home care. Now for the good news: periodontal disease is preventable and treatable. 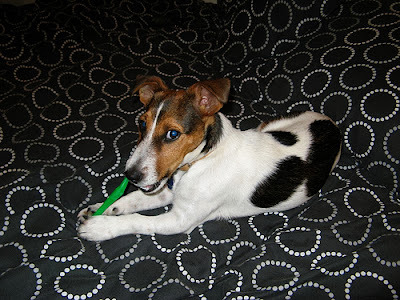 As for prevention, we can’t change your dog’s DNA, but home care is a vital part of keeping your dog’s mouth healthy. I recommend daily teeth brushing, ideally beginning as a puppy. It takes less than 12 hours for bacteria to attach to a tooth's surface. The bacteria then absorb calcium from saliva and become mineralized, forming tartar. This is why brushing is recommended daily, to continually break this cycle. While any type of toothbrush is fine, do not use human toothpaste, as it may cause tummy upset and the fluoride can be toxic. There is simply no substitute for brushing, because it mechanically breaks up the plaque, but there are other home care options when brushing simply is not possible. Ask your veterinarian to help you develop a custom dental home care plan for your dog. Based on what is discovered during your dog’s oral exam, your veterinarian may also recommend a professional dental procedure, which will involve cleaning the teeth, and possibly dental x-rays and extractions. For many dogs, these therapeutic dental procedures are like a drink from the Fountain of Youth. Clients are stunned by the dramatic positive changes in their dog’s attitude and vitality after pain and infection in the mouth have been resolved. While it’s my opinion and observation that a healthy mouth will extend a dog’s quantity of life, it is a fact that a healthy mouth will enhance a dog’s quality of life. That should be enough to make all of us take dental care more seriously! I agree, dental health is important to dogs, just like it is for us. I am guilty of not taking extra good care of my dogs teeth teeth though.....I have good intentions but good intention get ya nowhere! I was never too concerned about dental care for my dogs until I got Pierson. Sephi and Maya both were decent chewers. Sephi had excellent teeth at age 10 when she passed away. Maya is 6 now, and has excellent teeth too. Pierson is a different story. When I first got him he was a notorious poop-eater. Now that I have managed that bad habit, his teeth still tend to build up plaque easier than Maya's. He chews as much as she does, so I suspect some genetic reason for this. So, needless to say, I have to brush Pierson's teeth regularly.